VICOM has announced the 3410 series, a new family of digital RF signal generators from IFR Systems. Available in three frequency ranges from 250kHz to 2GHz, 3GHz and 4GHz, the 3410 series is used for testing and emulation of 2G, 3G and 4G systems; digital private mobile radio; wireless local area networks and Bluetooth systems. The 3410 series is the first high-performance digital RF signal generator family to combine full digital, vector and analog modulation in a 2U rack size. The 3410 series offers RF level accuracy of 0.5dB. Combined with a low output VSWR specification, measurement errors for real-world applications are kept to a minimum. Precise and repeatable measurements can be performed on even the most sensitive analog or digital receivers. Additional modes of operation are provided which allow the user to optimise the signal generator for specific measurement tasks. With fast GPIB operation and the incorporation of a high performance electronic attenuator, the 3410 series offers fast and reliable manufacturing test capability, maximising throughput. Carrier frequency and RF level switching speeds are <5 ms and the instrument is hardware-ready to support USB 1.1 interfaces. The use of an electronic attenuator ensures that test system down time is kept to a minimum. While offering more than 30 different modulation combinations, the 3410 series takes the complexity out of the configuration process through a new user interface that is capable of controlling all the advanced features required for digital and vector modulation. 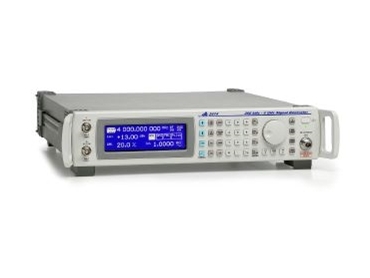 The 3410 series introduces the first touch-screen user interface to digital RF signal generators. A deeply nested menu structure is avoided and a refreshingly simple and intuitive user interface is provided instead. Wherever touch control is provided, an equivalent hard-key method is also available, allowing the 3410 series to be used in the harshest of working environments. At the same time, the 3410 series' new system architecture incorporates high-performance RF modulation in a small package. The 3410 series reduces size and weight by 35 to 50 percent over competitive instruments-and delivers the high performance expected in research and development and wireless manufacturing. Using the external IQ inputs, the 3410 series provides RF modulation bandwidth of up to 100MHz. Over this bandwidth, and covering the full frequency range of the signal generator, excellent modulation characteristics are achieved through the use of a proprietary IQ modulator design.